Back on August 1 2017, there was talk of a sculpture to be erected to represent the opening of the goldfield and the partnership that developed between local Iwi and the new settlers. 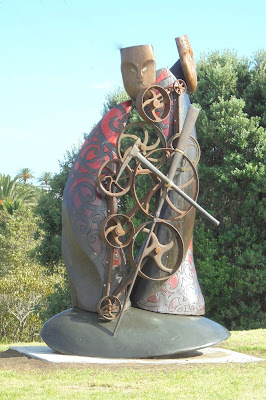 On 12 March 2018, the completed statue was placed on a site just south of the Kauaeranga Bridge, on the west side of the Ngati Maru Highway, just past Rhodes Park (and the WWI Commemorative Forest). At dawn, a blessing was performed by local Iwi Ngati Maru and on Wednesday 14th the public dedication was held. The 150th Commemorative Sculpture. While it is initially hard to even spot, as it blends against the trees behind it. Maybe this is not a bad thing and depicts a blending of the cultures and the merging of peoples on the goldfield. When you get closer to the sculpture, the detail and colours are very distinct. 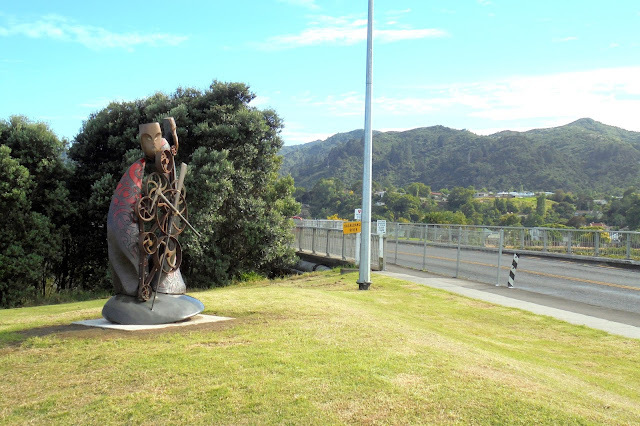 "A new sculpture at the Kauaeranga River bridge near Rhodes Park celebrates the cultures and history of Thames. The Thames southern gateway sculpture marks the 150th anniversary of the opening of the Thames goldfields. 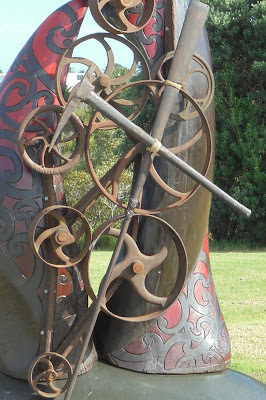 Master carver Darin Jenkins created the sculpture, which is embellished with Maori and Celtic design and large cogs and gears made from the A&G Price foundry. He was helped by Jason Tanna, Jackson Jenkins and Tyla Hart. The piece shows two stylised figures embracing, standing on a rounded piece of stone that resembles a mussel shell. 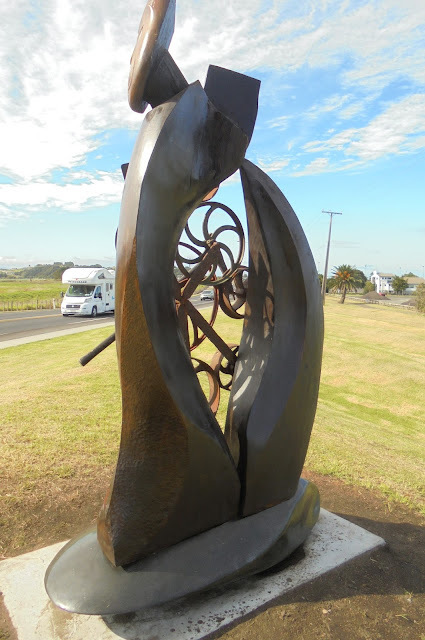 The base was carved from Katikati basalt by Tapu stone sculptor Jocelyn Pratt, and the metal work was completed by Thames artist John McKeowen. 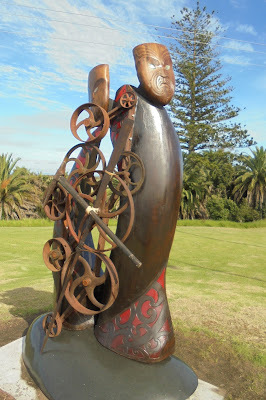 The sculpture represents the region's past, present and future, merging the cultures, industry and history of the area. Thames Community Board commissioned local iwi Ngati Maru to complete the piece with $50,000 the board had put aside to recognise the town's 150th." A selection of photographs, showing the statue from various angles follows. 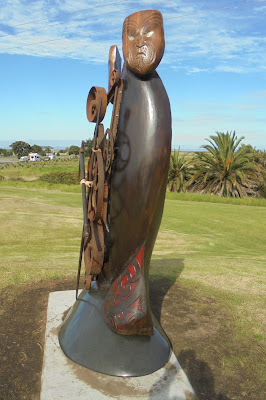 The Statue sits on a piece of basalt from Katikati (by Jocelyn Pratt) and resembles a mussel shell. The iron work is from cogs and gears from A & G Price (by John McKeowen). The carvings were overseen by Master Carver Darin Jenkins, and is of two figures embracing. ABOVE: Each aspect of the statue reveals a new interpretation, and shows different detail of carving, ironwork and stone work. 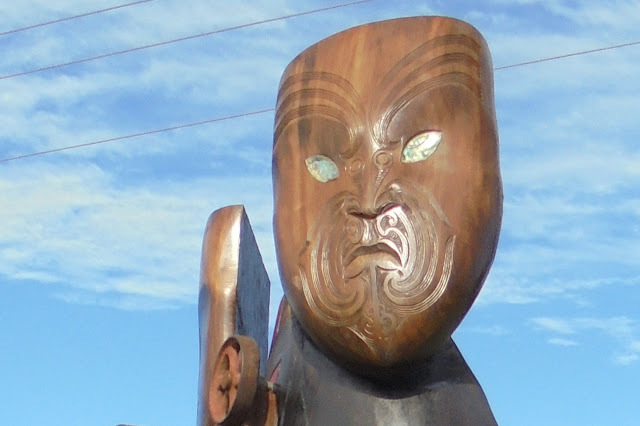 BELOW: A closer look at the 2nd 'face' that is angled to the north-east and closest to the Kauaeranga River. A view looking from the back of the new carving/statue towards Totara.